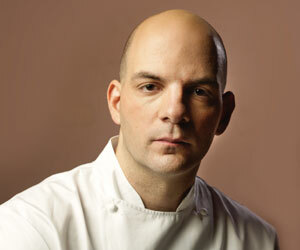 Mark LoRusso (Part 1 of 3) EDITOR'S NOTE: MARK LORUSSO IS NOW EXECUTIVE CHEF OF BOTERO AT ENCORE, WYNN'S NEWEST RESORT. Mark LoRusso, executive chef of Tableau at Wynn Las Vegas, had a lot on his plate when he decided to come to Steve Wynn's Las Vegas resort. Not only would he be in charge of dinner seven nights a week, but breakfast and lunch, too. That's alright, though. Chef LoRusso has always worked hard. A graduate of the Culinary Institute of America, he's always had a good worth ethic and a healthy yearning for learning. He has always taken his career seriously, and slowly but surely, it has certainly paid off. TravelsinTaste caught up with the extremely busy chef recently for an impromptu conversation about food, fish and the Vegas fun factor. When Chef LoRusso arrived in Las Vegas eight years ago, he thought the city had maxed out. He wondered, "Where are the people going to eat?" Now he sees a lot more people coming, especially from the east coast, with the distinct purpose of eating and seeing shows. "I'll talk to a lot of people, some from the west coast, a lot from the east coast, who come out here to eat," he says. "The word gambling doesn't even come up! I think Vegas is going to get a lot more of those type of people. People come to Las Vegas to have fun and to have a good time. They say to themselves, 'We're going to spend money. We're going to live a little bit crazier.' That's what makes the city so special." Despite people's love for food in Vegas, lunch has traditionally been a difficult sell there, except for restaurants in the most prime shopping locations. Chef LoRusso loves the fact that his restaurant is off the beaten path, however. It's away from the crazy environment in the casino and one has to find it first in order to eat there. And find it his guests have. Chef LoRusso calls it "a little gem inside the Tower Suites." His guests are happy to have a little privacy in an enclave away from the loud casino floor. It is a double edged sword, though, he acknowledges, and can sometimes be frustrating when you don't get a lot of foot traffic.